OPINION, PAGE 8 An international student wrote an essay about dealing with a relative’s death while an ocean away. SPORTS, PAGE 23 Football hasn’t committed to a starting quarterback, after a strong showing at spring practices. CORRECTIONS Accuracy is our business, so when a mistake is made, we’ll correct it as soon as possible. Anyone with inquiries about content in this newspaper can contact Editor in Chief Gillian McGoldrick at editor@temple-news.com or 215-204-6736.
he Kornberg School of Dentistry is expanding its efforts to teach dental students how to accommodate people with disabilities. The Kornberg School and Penn Dental Medicine began an Inclusive Dental program at the end of March to teach practicing dentists and students how to treat people with disabilities. The program partners with AmeriHealth Caritas, a Philadelphia-based health care management company that helps low-income people and people with chronic illnesses. Dental care providers who are enrolled in the AmeriHealth program will be given up to a 10 percent reimbursement by the health care provider for all dental services, said Amid Ismail, dean of the Kornberg School. The program’s goal is to make community-based dental care more accessible for people with disabilities. This dental care brings services to patients, rather than providing care in an office setting, and is designed for people who are homebound or have other barriers to accessing care, said Mark Wolff, dean of Penn Dental Medicine. “Disabilities can occur throughout the lifetime,” Wolff said. “Persons with disabilities require a special care and an understanding of how to best accommodate them.” Melissa Young, a senior journalism major, suffers from a form of muscular dystrophy called Spinal Muscular Atrophy, which limits her movement. Young uses a wheelchair and said a dentist that could come to her would be more accommodating. Ogbonna “Paul” Hagins, anoth- Goldstein, a Jewish immigrant who left Another candidate with Temple ties At least five of the 36 candidates for City Council’s at-large er Democratic at-large candidate who Soviet Ukraine as a child, is running in is Drew Murray, a 2002 MBA alumnus, brands himself as “Philly Green Man” the Republican primary for an at-large who’s also running in the Republican candidates are Temple alumni. because of his environmental focus, said his education experience in the School District of Philadelphia and at Temple highlights the longtime inadequacies of the city’s public education system. Hagins attended Temple as a College of Liberal Arts student from 1984-86, but did not graduate, he said. Though he was considered a high-performing student at his public high school, he claims, this was still equivalent to a middle school education when compared to student performance at other schools. Hagins ended up working as a teacher at the Murrell Dobbins Career and Technical Education High School on Lehigh Avenue near 22nd Street and is now retired. If elected to City Council, he wants to improve the school system’s training for students to go into green technology and STEM careers. Hagins sees himself at odds with the city’s Democratic establishment. “We need to be understanding of the citizens of the city,” Hagins added. “For me, it’s about taking care of the least of us, not the government version of the ‘Verizon Friends and Family plan,’ the idea [that] if you’re not part of the club, you don’t get anything.” These left-leaning ideas will be challenged by Irina Goldstein, a 2007 journalism and advertising alumna. 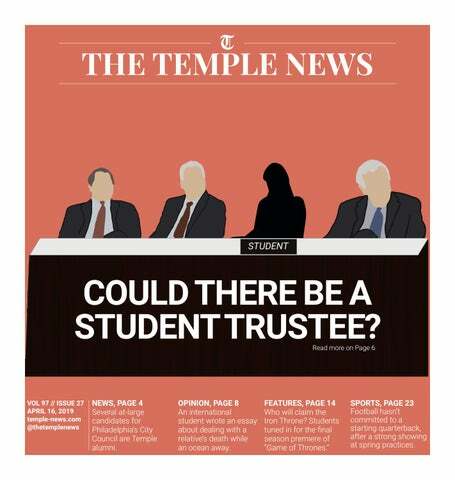 Are you the next Editor in Chief of The Temple News? Are you the next Templar Editor? The Temple News, Temple University’s award-winning student newspaper, and Templar are looking for an editor in chief for the 2019-20 academic year. A good candidate should demonstrate strong leadership ability and proven managerial skills with prior media experience. A candidate's experience in the business, editorial and design aspects of newspaper/yearbook publishing will be a factor in the selection of the editor. Candidates should submit a completed application, two letters of recommendation, a current resume and a number of relevant work samples to John Di Carlo, Student Media Managing Director, in Room 243 of the Howard Gittis Student Center. Please send an email to john.dicarlo@temple.edu to obtain an application. Finalists for the position will be interviewed and selected by the Temple University Publications Board. Applications for The Temple News and Templar are due Friday, April 19.
fect the stability of blocks in neighborhoods,” said Gregory Heller, the executive director of the redevelopment authority. “There’s the potential that you get enough homeowners within a concentrated area, you could start to have an impact on blocks and neighborhoods.” The time it takes for residents to receive loans depends on homeowners’ eligibility, Heller said. Those who apply are required to have credit scores above 580 and homeowner’s insurance, and be up to date on taxes and public utilities or enrolled in a payment plan with the city. The program’s lenders will offer eligible homeowners 10-year loans ranging from $2,500 to $24,999 at a 3 percent fixed interest rate. Like other areas of the city, North Philadelphia has a substantial amount of low- to middle-income homeowners, including people with disabilities and seniors, who could use the program to improve their quality of life, Heller added. Adrienne Patterson, 56, who has owned her home on Gratz Street near Berks for 19 years, needs to add railings to her stairway and bathroom to make it easier for her to move around without risking falling, she said. Patterson has physical distress, making it difficult for her to complete daily tasks in her home, she said. The Restore, Repair, Renew program could provide the funds Patterson needs to alter her bathtub to make it more accessible. “The problem would be that most of [my neighbors and I] don’t have home savings for repairs,” she said. “...whether we just don’t think about it or wait until it happens” She has yet to apply for the program and said a lack of funding and knowledge of the program are the main reasons she hasn’t taken steps to enroll. “I don’t know what direction to go,” she added. SAMEET MANN / THE TEMPLE NEWS Residents can apply for the Restore, Repair, Renew program if they meet certain low- or middle-income criteria. SYDNEY SCHAEFER / FILE PHOTO The Board of Trustees met in Sullivan Hall on October 10, 2017. Now, Temple Student Government is advocating for a Temple student to join the Board as a voting member. but we don’t even have a say in what they’re doing,” Capozzi added. Governor Milton Shapp appointed Cohen to the Board as one of the Commonwealth’s 12 appointees. O’Connor, who did not attend Temple but was awarded an honorary degree in 2013, would not support a student voting seat unless the Board simultaneously creates one for a faculty member, he said, because the university’s faculty have been “railing that for years.” “I’m not going to solve one problem to create another,” O’Connor said. If the majority of the Board agreed with O’Connor, establishing these two seats would require the university to change its bylaws, allowing 38 Board seats instead of 36, Nadol said. Bylaw changes are submitted to the Committee on Trustee Affairs, forwarded to the full Board for a vote and passed if the majority is in favor. The Board typically votes on changes to bylaws and elects new trustees at its annual meeting in October, she added. Reporters and Editors, an organization that supports investigative journalism around the world. Temple was up against stiff competition in 2017 — including Scott Pruitt, the former head of the Environmental Protection Agency. Even though the state doles out hundreds of millions of dollars to state-related schools, they don’t have to follow the same transparency standards that regular Pennsylvania State System of Higher Education schools do. For example, Temple’s Board is technically allowed to hold private meetings in “executive session” — something that never happens at real public universities. At the other state-related schools like Penn State, leaders abused this lack of transparency to hide details of Jerry Sandusky’s years of sexual abuse of children and the school’s role in the scandal’s cover-up. It’s because of this that the Editorial Board believes at the very least, the Board of Trustees should open its executive sessions to the public. While we absolutely favor Temple Student Government’s proposal to add a voting, nonTSG member to the Board, we recognize that adding a student to vote on the Board won’t do much to sway opinion. It also won’t fix the persisting problem of no oversight or transparency from the Board, because the trustees would expect the student member to maintain an unspoken rule of keeping deliberation hidden from anyone not behind that closed door. Temple cannot sell itself as a “public” university, while blocking the public from the most important decisions made on campus. and prejudice from their white, male counterparts. The film concludes with Katherine Johnson, a mathematician, calculating the trajectory for Project Mercury, a difficult task no man on the team could accomplish. I can imagine Johnson, who is now 100 years old, smiling about Bouman’s scientific breakthrough. Bouman’s image is now circulating all over the internet and media outlets. Everyone tweeting Bouman’s photo should give her credit, but I’m still not seeing her name posted often enough. “Women do hold up half the sky, after all,” said Rebecca Michaels, a Temple University photography professor. “Movements such as the #MeToo movement are making women visible in a world where women have been unacknowledged, and women such as Bouman deserve to be seen and heard.” Bouman’s work shattered the glass ceiling into a million pieces. EMMA PADNER / THE TEMPLE NEWS Electrical engineering Ph.D. student Kaitlyn Sitch uses a simulation program to research how microgrids can make transportation more sustainable. tant. But some of her friends weren’t so lucky because they couldn’t find housing, she said. “It’s very difficult, to say the least,” Ross said. “A lot of my friends actually became homeless.” Ross and Jordan have been filming apartments with a 360-degree camera to create the images. They are considering developing their own virtual reality software or partnering with another company to help landlords convert their standard phone images to 360-degree visualizations. Adulthood is meant to save students time apartment hunting by allowing them to take tours virtually rather than in person, Ross said. The app is still in development, but a prototype is available online. The official app is expected to launch within a year. “Virtual reality is going to be taking over soon, and we want college students to be a part of the whole process,” Jordan said. Jewel Thomas, a freshman political science and economics major, is looking for apartments near Main Campus for next year. The process has been very time consuming, she said. “Looking for apartments that fit my needs, in my price range, at the location I want makes the process kind of difficult,” Thomas added. Ross and Jordan have so far funded the project themselves, but will spend the summer looking for investors and launching a crowdfunding page. The app also allows students to filter for their preferences and will soon include a feature to help students find potential roommates. Once someone has picked a place, they’ll be able to message their landlords through a direct messaging system, receive information about their leasing agreement and pay and split rent with their roommates. ERIK COOMBS / THE TEMPLE NEWS Kyle Jordan, a 2017 chemistry alumnus, wears an Adulthood app shirt and hat at the Student Center on Monday. Jordan is a founder of the housing app. Winter is finally here for ‘Game of Thrones’ fans is the arrival of the Night King and his each one has their own journey and their The hit HBO drama series about what happens next.” The anticipation for the last six army of White Walkers, formerly-hu- own story and at the end, it almost ties returned for its eighth and final episodes, in which viewers will find man ice creatures. up together,” he said. season Sunday night. Who do you hope takes the Iron Throne in “Game of Thrones” and why? I want to see Tyrion. He’s the smartest character. Women find strength, empowerment in CrossFit CrossFit gyms are notoriously exThe club will meet at 5:30 p.m on Of the 100 members who have at the IBC. This could be intimidating to pensive — topping $150 a month com- Thursday outside Pearson Hall for ansigned up for a new CrossFit some women, he added. “I don’t personally get intimidated, pared to other gyms with rates of $10- other run to the Philadelphia Museum club, about 90 are women. but I know a lot of my friends will walk into STAR and then just walk out,” Pierson said. “We want to create a community where people are not intimated to go to the gym and feel good about themselves and working out.” The women-led club hopes to tear down stereotypes that women only do cardiovascular exercises and group fitness classes, said Eileen Armani, a sophomore nursing major and the club’s secretary. Hearing gender stereotypes at the gym, like snide remarks that women are not as athletic as men, can have a negative effect on a woman’s athletic performance, according to a 2014 study in the journal Psychology of Sport and Exercise. When gender differences were not discussed, the study found that men and women performed equally. “Usually, when I tell men I can lift more than them, they give me a look like, ‘Yeah, right,’” Pierson said. “Then they see me do it and think it’s pretty cool.” As a sport, CrossFit focuses on improving performance more than looks and considers all members “athletes” rather than categorizing them in groups by gender, weight or age, according to BoxRox, a competitive fitness magazine for people who do CrossFit. Both Pierson and Armani are active members at CrossFit Fairmount, where Armani was named the gym’s April Athlete of the Month. They are in conversations with the owners at CrossFit Fairmount about using the space to train in the fall and are currently figuring out schedules and the cost of a student discount, Pierson said. BecomingTU breaks into male-dominated admin The historic ticket will have to advocate for students to Temple’s male-dominated administration. BY ALESIA BANI For The Temple News Earlier this month, students at Temple University made university history by electing BecomingTU — an all-women campaign — as the 2019-20 Temple Student Government. “Why do I need a white male to speak for a Black woman when there’s a Black woman who can speak for herself?” asked Calyx Clarkson, a senior theater major and BecomingTU’s director of operations. TSG has had a woman president in the past, including law and business alumna Nadine Mompremier in 200809 and early education alumna Natalie Ramos-Castillo in 2010-11. But this will be the first time the top-three spots are led by all women. On Temple’s administrative level, current president Richard Englert and nine of the university’s former 10 presidents have been men. Ann Weaver Hart, who served from 2006-12, was Temple’s first and only woman president to date. Out of the 14 deans that serve Temple’s 17 schools and colleges, only two deans are women — in the Tyler School of Art and the College of Public Health. Additionally, of the university’s 33 current trustees, only six are women. “In order to uplift other women you need to be willing to make the jump,” said Katherine Desrochers, a junior political science and strategic communication major and BecomingTU’s director of communication. “Our campaign is a testament to that.” The executive team-elect faced scrutiny during the campaign they believe their male counterparts would not have faced, Clarkson said. CLAUDIA SALVATO / FILE PHOTO Incoming TSG Vice President of services Laryssa Banks (left to right), President Francesca Capozzi and Vice President of external affairs Kaya Jones participate in the final TSG executive debate in the Student Center on April 1.
ident-elect of external affairs for BecomingTU. “They thought their comments could break us down and that we weren’t strong enough to handle it,” Jones said. “[They thought] our emotions would get the best of us, as people think women’s emotions do, but we only took those in stride.” “As an all-female campaign, we have to be flawless,” Desrochers said. “If we’re not, then they’re going to come at us 10 times harder. ...We definitely saw that.” This sexism is apparent at every level of government. In the 2016 presidential election, Hillary Clinton was questioned about the impact her menstrual cycle would have on her leadership. A man from Pennsylvania questioned this in a letter to the editor of the Williamsport Sun-Gazette, New York Magazine’s The Cut reported. by our teammates’ success. We want everyone to do good so we push and motivate each other every day in training. To see her running like this now motivates everyone.” Junior mid-distance runner Millie Howard, who is from England, also helped Gottlieb last year by sharing similar experiences from her first year in America, Gottlieb said. “We’re very supportive of each other in general on our team,” Gottlieb added. “[Howard] was really good at teaching me everything that she had experienced during her freshman year and helped guide me for the future. We also just really push each other and celebrate each other’s success.” Gottlieb will run in the Larry Ellis Invitational in Princeton, New Jersey, on Saturday before competing in the Penn Relays on April 25 to 27. COLLEEN CLAGGETT / THE TEMPLE NEWS Redshirt-sophomore quarterback Todd Centeio throws a pass during Temple’s Cherry and White Fan Fest at the Temple Sports Complex on Saturday. pleted throws from both inside and outside the pocket while showcasing his ability to make plays on the run. This spring, Centeio has more power behind his throws, especially on the run, redshirt-junior tight end Kenny Yeboah said. On Saturday, Centeio scrambled to his right and delivered a strong throw to Yeboah along the sideline during the Owls’ 11-on-11 practice session. “Since I got here, I’ve proved people wrong,” Centeio said. “I don’t feel I am just a runner. I feel I have that perfect blend of throwing and running.” The Owls’ coaches are pleased with Centeio’s development after his performance in spring practices, Carey said. Centeio took time to adjust to the new playbook and practice style. Everything started to click for him about a two weeks ago, he said after the Owls’ practice on April 9. DYLAN LONG / THE TEMPLE NEWS Junior Paolo Cucalon celebrates during Temple’s 7-0 win against Lehigh University on March 24 at the Student Pavilion.